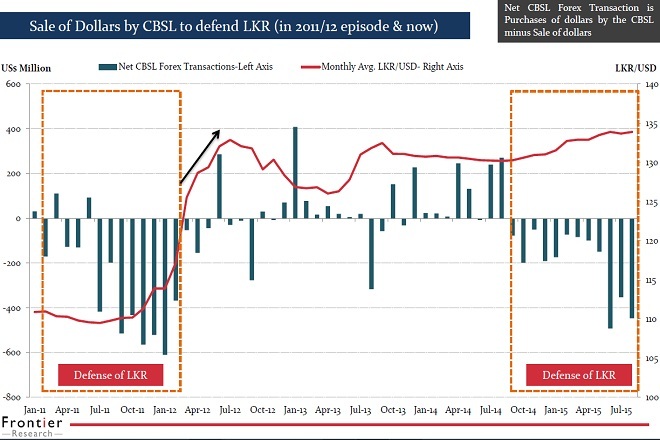 Oct 05, 2015 (LBO) – Acting quicker than it did in early 2012, the decision by Sri Lanka’s Central Bank to give up defending the rupee in September of this year bodes well for a quicker recovery of foreign exchange reserves. But enamored with an additional objective of economic development, that goes beyond financial and price stability, amid very low inflation, the hierarchy of the Central Bank may continue to flirt with loose monetary policy. That does not bode well for a quick recovery of reserves. In 2011 and early 2012, the currency defense leading up to the devaluation was greater than the latest cycle. In this sense the CBSL acted quicker in floating the rupee than it did last time. The Central Bank sold 4.1 billion dollars from January 2011 to February 2012 in the 2011-2012 cycle to defend the rupee. This time, since August 2014, it is around 2.7 billion dollars, Shiran Fernando, an economist from Frontier Research said. A key factor driving external weakness is an outflow of dollars from government securities. 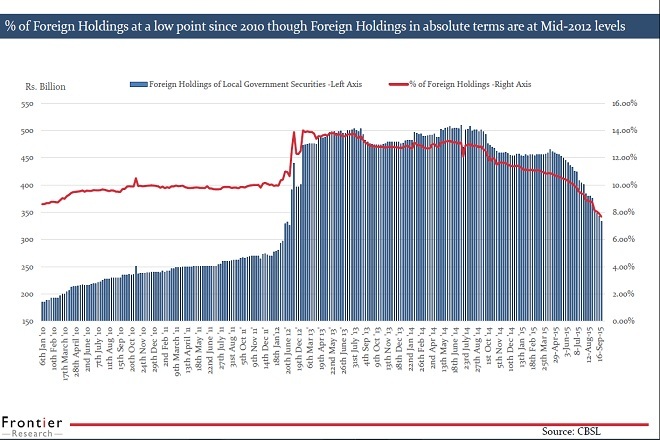 Foreign holdings as a percentage of total local government securities now stand under 8% which is the lowest since 2010 for this metric. “The decline of foreign holdings pre-float of the rupee is understandable. But the sustained decline since the 4th of September is worrying,” Fernando said. “Probably there could be further declines leading up to the Fed rate hike and could ease when emerging market volatility ceases,” he said. 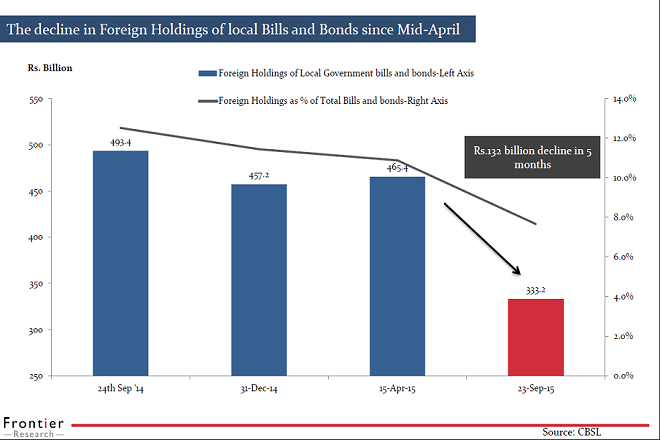 Data shows a 1.15 billion dollar drop in foreign holding of treasury bills and bonds during the last 12 months. Despite the possibility of a U.S. rate hike and India’s consumer price index inflation running at 3.6 percent in August, India reduced policy interest rates by 50 basis points to support the economy. Sri Lanka’s Central Bank now faces a tricky decision. There is a possibility of hiking interest rates if credit growth continues at the current high pace of 21 percent, the Central Bank said last week. The IMF has also suggested a tightening bias. According to recent statements, Fernando believes the Central Bank is moving away from an easing bias and opening the door to a hike. But with headline inflation at negative 0.3 percent in September, down from negative 0.2 percent in August, the Central Bank doesn’t appear to be worried about inflation. According to the Deputy Governor of the Central Bank, Nandalal Weerasinghe, there are no visible signs of printing of money. In that sense they are not concerned about a 187 billion rupee holding of government securities, a level last seen in December 2012. The peak holding of government securities during the 2012 cycle was 266 billion rupees in April 2012. “The central bank in the past has been restricting its mandate to financial stability and the control of inflation. There is a third objective which is mandated in our Monetary Law Act which is enhancing economic development of the country through various forms,” Governor Arjuna Mahendran told media last week. “One is through getting involved in the regions in terms of looking at regional development and being able to pilot particularly the flow of banking credit to different areas of the country,” he said. Although inflation has been driven by lower international commodity prices, a greater pumping of credit to the regions could stimulate regional development, according to the Governor. The key question is whether Sri Lanka wants to position itself as an exporter nation, in which case a weak rupee is preferable, or Sri Lanka wants to become a knowledge economy, in which case a stronger rupee is preferable. Recent comments from the Central Bank suggest we are positioning ourselves as an exporter nation.